Jujube fruit – What are the uses of Jujube fruit? How many years it takes to Jujube tree to bear fruits? 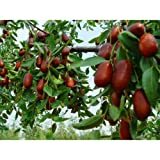 Jujube fruit uses: eaten raw, dry can be used for alcoholic beverage or medical uses, Jujube yield fruits after 2-3 years.